Your reviews on running shoes have been spot on for me. Any chance that basketball shoes can be part of what Samantha reviews? Absolutely. We have plans on reviewing basketball shoes, tennis shoes and soccer cleats, since these sports are woefully underrepresented in shoe reviews. Thanks Bob! What would be the best running shoe for sesmoiditis? I have a semi-narrow foot. The wet test shows neutral to normal arches. I have also had issues with kneecap pain. I usually wear a stability plus shoe or a motion control shoe. I am currently having problems with my right big toe and was diagnosed with sesmoiditis years ago, so I assume it is the same issue. I am 5’5 and weigh 128. I am running about 10 miles per week, biking on days between 3 mile runs on a high school track. I have tried a dancer’s pad, and a semi-rigid plate in my shoes for running. Both have helped a little. Just wondered if a certain shoe might be better for this problem. The most important criteria is to first find the right fit. 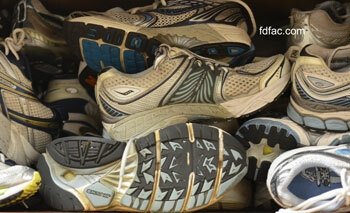 If you have a narrow foot and the shoe is too wide, your forefoot will move more, making sesamoiditis worse. Shoes which run narrow, have above average cushioning, and minimal forefoot flex include: Saucony Hurricane 13 (B), Asics 2160 (2A/B), Mizuno Wave Alchemy 11 (2A/B), Brooks Addiction 10 (2A/B) and Brooks Trance 11 (2A/B). Once you find the right shoe, if you still have pain,you will want to make an appointment with a sports medicine podiatrist to evaluate.